Invite Batman, Robin, Cat woman, Joker, and Riddler to your party with this beautiful Batman Jumper for rent. 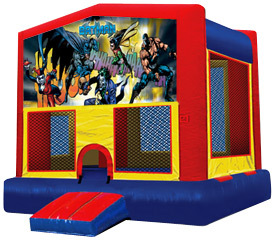 Our Batman Bounce House Rental will be a huge success on your party! We from BounceHousesForRent.com will provide you with this new and clean Batman Theme Jumper. Our price includes delivery, setup, and pickup within our delivery area. We serve parts of Los Angeles County and Orange County, California. Great service!! My kids love the jumpers! Always great service, timely, and a very clean and well-maintained jumper. This was perfect for my son's 3rd batman themed birthday party! Prompt delivery, set-up, clean up and pick up. The kids made full use of it. I was also impressed with how new & clean the jumper was! A cool deal all around and hard to beat the price. I'd book again.